A whistleblower claims that then-National-Security Adviser Michael Flynn promised that sanctions on Russia would be “ripped up,” enabling a business project for which he’d worked to move forward, according to Representative Elijah Cummings, the ranking Democrat on the House Oversight Committee. The claim comes from a letter dated Wednesday and first obtained by The New York Times, which published it. If the anonymous whistleblower’s account is true, it offers the strongest evidence that the Trump administration hoped to immediately end sanctions levied in the waning days of the Obama administration. It would also represent the missing link between some essential parts of the Flynn saga and Special Counsel Robert Mueller’s probe into Russian interference in the election. The account might explain why Flynn lied to FBI agents, telling them he had not discussed the sanctions with then-Russian Ambassador Sergey Kislyak, and it helps to clarify the role of a bizarre scheme to build nuclear reactors in the Middle East with which Flynn had been affiliated. The account could have political ramifications, too. As President Trump seeks to distance himself from Flynn, who pleaded guilty last week and said he is cooperating with Mueller’s investigation, the idea that Flynn was working out of self-interest offers Trump a new talking point. The Middle East reactors plan was first reported by Newsweek in June. The elaborate plan was backed by a range of ex-military brass, who nicknamed it the “Marshall Plan.” The U.S. would partner with Russia’s state-run nuclear-energy agency to build civilian nuclear plants across the Middle East. Saudi Arabia would bankroll the construction, and Arab countries would buy military equipment from Russia under the deal, which aimed to convince Arab countries to give up plans to start their own nuclear programs. Flynn traveled to Egypt and Israel on behalf of the plan, but he didn’t disclose his role until February, two days before he was fired from the administration, and he did not disclose that he’d been paid for it. Previous reports had already raised questions about Flynn mixing government and private work on behalf of the plan. Politico reported he had continued to push the idea during the Trump transition, between when he was named national-security adviser in November and the Inauguration, without disclosing his role. The Wall Street Journal reported that he instructed National Security Council members to meet with “Marshall Plan” staff, too. Congressional Democrats had charged that he failed to make required disclosures when he took the trip. Yet it was unclear how all of this connected to Flynn’s other legal troubles, including his contacts with Russian officials on behalf of the Trump administration. Nor was it clear why Flynn—a seasoned intelligence agent who ought to have suspected that intelligence intercepts would contradict him—was so foolish as to lie to FBI agents about his conversations. If Flynn were working to protect his business interests, it might explain his lie. While Trump had argued during the campaign for improved relations with Moscow, it’s unclear what motivation other members of the administration might have had for immediately trashing the sanctions. In any case, it didn’t happen. On January 24, the FBI interviewed Flynn. Two days later, acting Attorney General Sally Yates informed Don McGahn of the interview and likely told him Flynn was lying. On February 13, after The Washington Post reported that Flynn had lied to Vice President Mike Pence about his contacts with Kisylak, Flynn was forced out—even though the White House had known about his lie for more than two weeks. Under political pressure, Trump did not withdraw the sanctions, and in July, over Trump’s objections, Congress overwhelmingly passed a bill to keep the measures in place. Cummings wrote that the whistleblower contacted him in June 2017, but that Cummings was reluctant to make his account public, both to protect the whistleblower, and also because Mueller’s office had asked Cummings to wait until it had finished certain investigative steps. Cummings wrote he had now received the signoff. 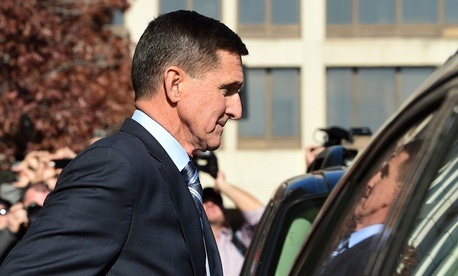 Under an agreement on Friday, Flynn pleaded guilty to lying to the FBI, but escaped charges in a variety of other possible matters, including his failure to disclose trips as well as his failure to timely disclose lobbying on behalf of the Turkish government. Cummings’s letter suggests that Mueller was aware of the dubious maneuvers around the nuclear plan as well. It’s thought that Flynn pleaded guilty and agreed to cooperate to avoid additional charges, but it’s not yet clear what testimony he might be able to offer in return. The letter lays bare some of the tensions between Cummings and his Republican counterpart Trey Gowdy, the chair of the Oversight Committee. Cummings accuses Gowdy of dragging his feet on the panel’s investigation, and argues that Mueller’s criminal investigation should not preclude congressional scrutiny—citing the House Select Benghazi committee that Gowdy chaired as an example. The greater political ramifications are presidential. Trump fired Flynn only after his lie to Pence became public, and his administration publicly defended Flynn even after dismissing him. Trump then pressured then-FBI Director James Comey to drop the FBI’s investigation into Flynn, according to notes Comey took at the time and sworn testimony. Trump has denied Comey’s account, but his apparent eagerness to shield Flynn remains unexplained. In a narrow sense, the Cummings letter might provide Trump a lifeline. As he seeks to distance himself from Flynn, belatedly, the president might argue that Flynn was nefariously working to his own ends, without the president’s knowledge—the latest evidence that, as Trump has repeatedly claimed of late, he has no involvement in collusion with Russians. Yet that excuse has several weak points. One is that Flynn has said that a senior transition official directed him to speak with Kisylak to try to defeat a UN Security Council resolution before the inauguration. That means whatever Flynn was doing was not contained only to himself. Another is that Flynn has yet to testify himself, but is expected to do so as part of his deal, and his testimony could implicate other transition-team members and maybe even the president. Aside from all this, however, each new piece of evidence of Flynn’s missteps and alleged corruption further calls the president’s judgment into question. For any other president, such a parade of incriminating revelations about a top official would be catastrophic. But Trump has so many political scandals that practically speaking he has no political scandals—they all evaporate into a lingering, poisonous miasma that floats permanently over the West Wing. The Trump team has tried to downplay Trump’s connections to Flynn, calling the retired general “a former Obama administration official.” In fact, President Obama both fired Flynn from his post at the Defense Intelligence Agency and reportedly warned Trump not to hire him. Yet Trump, who has repeatedly bragged about his prowess in hiring the “best people,” chose as his closest adviser on the most sensitive matters of national security and defense a man who repeatedly avoided legally required disclosures, lied to FBI agents, and mismanaged the DIA while leading it. If the whistleblower’s account is to be believed, he may also have used government office to enrich his business partners and himself. Later, Trump tried to run interference for Flynn with the FBI director. The basic question on Flynn is the same as it was in March: How did this guy ever get hired as national-security adviser?